I love Mincemeat, always have. When I was a kid, I would sit and wait patiently for a slice of mincemeat pie. I would sit at the “Grown Up” table and eat a slice of mincemeat pie while my brother and sisters would sit at the “kiddie” table and eat pumpkin pie. The adults would be talking, drinking coffee, and enjoying mincemeat pie. I would have eaten mincemeat pie regardless just so I could sit and listen to the adults discussing adult topics. have been making this dessert ever since. This recipe combines two classic holiday favorites; mincemeat and pumpkin. A layer of mincemeat is spread on top of a buttery shortbread crust, that had been baked for 10 minutes and allowed to cooled. Pumpkin is then combined with sweetened condensed milk and spices. This mixture is spread over the mincemeat layer. Reserved crust crumbs are sprinkled on top of the pumpkin layer and baked. The end result is a pumpkin pie bar with an extra layer of “Oh, yeah!” Pumpkin Mincemeat Bars made with Nonesuch mincemeat are super delicious. 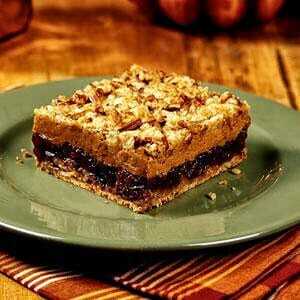 Try something new this holiday season and make these yummy Pumpkin Mincemeat Bars. Haven’t tried mincemeat in while? Never tried mincemeat before? Well, it’s high time to give this “other” holiday classic dessert favorite try. You might be surprised at what you’ve been missing. You might even ask yourself, “Self, why haven’t I tried mincemeat sooner? Mincemeat is a mixture of usually apples, raisins, dates and nuts. Here is another recipe you might like to serve this holiday season. This cool and creamy pie can be stored in your freezer, leaving more room in your refrigerator. Lemon Pineapple Cheesecake Pie is perfect to serve after any heavy holiday meal or when you want a lighter pie with a tropical flare. If your not ready to make a switch and make this classic holiday favorite for Pumpkin Mincemeat Bars, there is always this recipe for Pecan Pie Bars! Two holiday classics collide to make one delicious bar. Combine flour and sugars. Cut in butter until crumbly. Stir in nuts Reserving 1 1/2 cups crumb mixture. Press remaining crumb mixture into bottom and half way up sides of 13 x 9 x 2 inch lightly greased baking dish. Spoon mincemeat over crust. Combine pumpkin, sweetened condensed milk, eggs, cinnamon, nutmeg and salt. Mix well. Pour over mincemeat layer, top with reserved crumb mixture. Bake 15 minutes. Reduce oven to 350º Bake 40-45 minutes longer or until golden brown around edges. Cool. Cut into squares. Serve warm or at room temperature. Store leftovers covered in refrigerator. *This is not a sponsored post. We have not been compensated by any company mentioned in this post. Here at Turnips 2 Tangerines we like to pass along to our readers products that we love and love to use in our own kitchen. **This recipe was made with these fantastic products. Eagle Brand, Libby’s, Nonesuch Mincemeat.